Send a friend a tip to this site. Type his e-mail adress and send. Any shape is possible - oval, circle, rectangle and even other more complex shapes can conjure. Risk pool. Children, animals ..... Surely everyone has experienced or heard about the dangers that lurk in connection with swimming pools. Our protection system pool is almost perfect. That everyone who knows its own outdoor swimming pool. And what are the easiest. Just look at the following pages, correctly gauged pool and simply order REVOLUTIONARY inflatable roof. Welcome to the website of the manufacturer of PVC roofing of any size and shape. This revolutionary roofing system can be applied to overhead and recessed pools. This will ensure maximum safety and protection from the weather pools. 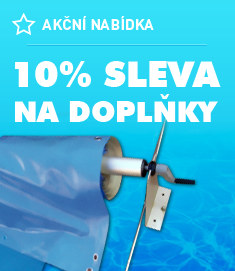 Products ie inflatable shelter for all possible types of outdoor pools are manufactured in our own premises on tables measuring 10 x 6m and HF welded method. Our team of experienced technicians can handle this method and guarantee product quality. The used film is from a German supplier. Its composition and UV protection is one of the top in quality foil for outdoor use. Therefore we can afford two years warranty. Own life is around about 8 years. Based on long-term experience from abroad (mainly Germany) is a service life of 10 years and routinely. But it depends on the quality of water in the pool, because it is signed by the highest rates of lifetime. Especially in Bohemia water quality and filter catching chemistry. There are cases when even stainless steel rust. But that is another story. Again nothing is not to exaggerate and crystal water body can be quite dangerous, let alone sails.